The ability to control devices and machines remotely is invaluable to many of us in our everyday and working lives, and although remote desktop apps tend to offer a broad range of functionality, sometimes, only the very basics are necessary. XDA-Developers Member RavinduSha has come up with a nifty app offering a remote switch-off feature for Android, and although we’d perhaps struggle to think of many occasions where such an app would be immediately necessary, it’s certainly a useful one to have in the inventory. Most of us keep our devices close by, but even in this day and age whereby smartphones are of tremendous importance, it’s not uncommon for people to misplace them. If, for example, you left your device at work and had no way of retrieving it until the next day, RavinduSha’s app – aptly entitled Remote Turn Off – would be an invaluable tool in at least helping you salvage some battery life for the next day. As well as practical uses, it’s actually a pretty cool / fun app as well. If you didn’t want to show off the feature to your buddies, you could take it a step further and use the app to begin switching their phone off, perhaps preceding such an event with a story about viruses flying about which force devices to spontaneously shut down. Remote Turn Off is very easy to get started with, although it does require root access in order to run. From there, you need to flash the relevant ZIP file, set the correct permissions, and you’re ready to go. 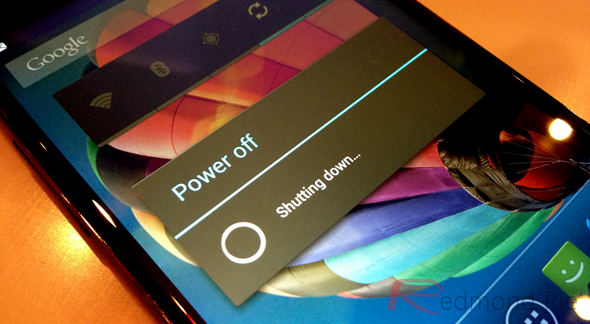 Sending the message ‘power#off’ to the device will, after a first run prompting you to confirm root access, switch the device off, but the fact any number can be used to shut the device down may be seen as a caveat by some. But with no app icon whatsoever, it’s a ready-made tool for anybody looking to play a prank on friends in ownership of rooted devices. It’s absolutely free of charge, and if you want to give Remote Turn Off a try for yourself, please do check out the original thread. Say your phone is encrypted, and someone steals it while it is unlocked. You need a way to shutdown the phone so that the thief cannot get to your data.